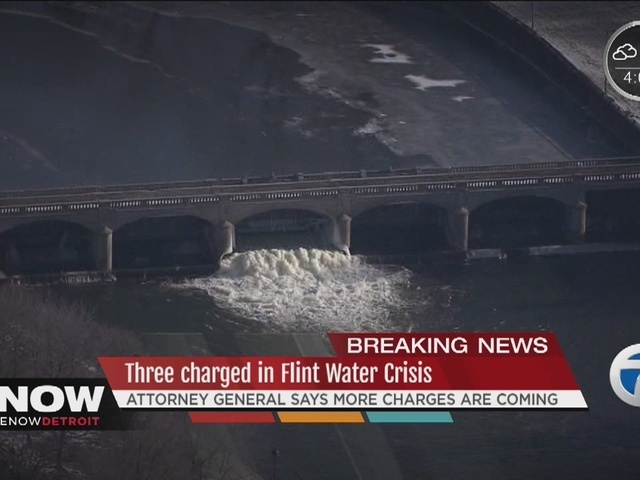 Three people have been charged in connection to the Flint water crisis. Michael Prysby from the Michigan Department of Environmental Quality is facing six counts, including two counts of misconduct, two counts of tampering with evidence and two counts of violation of the Michigan Safe Drinking Act. Stephen Busch from the Michigan Department of Environmental Quality is facing several counts including one count of misconduct, two counts of tampering with evidence and two counts of violation of the Michigan Safe Drinking Act. The criminal defense for the 2 DEQ state officials will be paid with state funds. Michael Glasgow, Flint Water Plant Certified Operator, is facing two counts including tampering with evidence and willful neglect. Allegations suggest records were changed in order to cover up positive lead results. In a news conference following the charges, Michigan Attorney General Bill Schuette said no one is immune from the law. These are just the first set of charges and hinted that there could be additional charges.